If you read our post from a couple of days ago, we talked about two storms. The first of the storms arrives Thursday. That storm looks to be strengthening and will deliver more moisture than we originally anticipated. The 2nd storm looked like it was going to head north of us. That storm now has moved considerably south, and is packed with moisture. 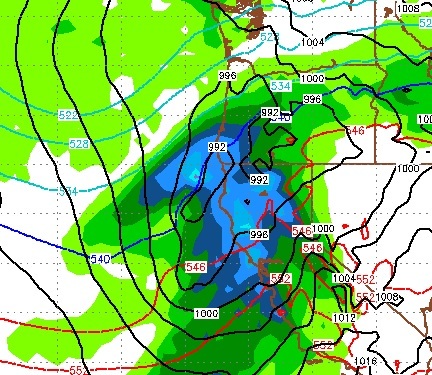 It is coming sooner than we anticipated and should arrive very early Monday morning just as our first storm is exiting. Folks, this is starting to look like one of those weeks we had in January. 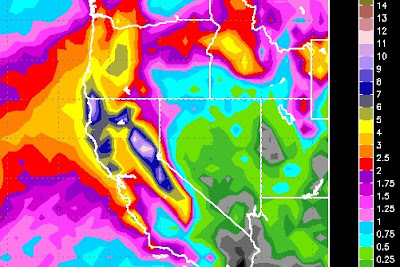 I expect copious amounts of snow to fall in the Sierra and Carson Range, with significant rain hitting the leeward valleys, as much as 1-4 inches depending on your location. This storm has moved so far south that it will have a large effect on Central and parts of Southern California as well. All of the Sierra and Carson range are in the 5-12 inch total. While the valleys and foothills are in the 1-5 inch range. Not to get too far ahead of ourselves but a third storm is also on the horizon as our pattern starts to look more like January! Snow levels for the first storm will start low, move to 7,500 feet and then come down again, perhaps as low as 5,500 feet. The second storm looks to be bringing cooler air with it. It will start warm and snow levels will quickly plummet by Tuesday. I believe this is all snow above 7,500 and we could receive in the 5-10 feet (or more) by this time next week at that elevation.